Are you piggybacking on the Netflix, HBO Go, Amazon Prime, Hulu, etc, account of a friend or family member? A new report claims that you’re part of the 6% of U.S. households that are costing these companies $500 million in revenue this year. 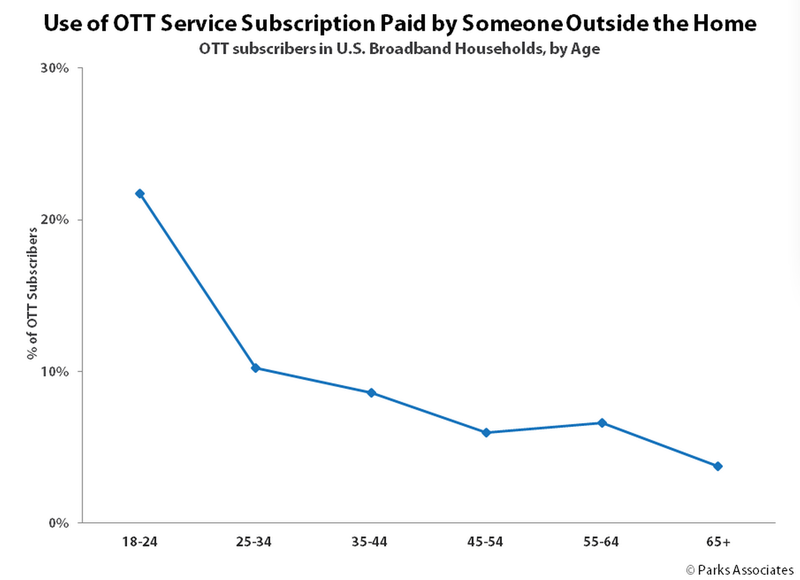 This is according to a new report from Parks Associates, which found that 1-in-5 young adults in the U.S. are using someone else’s account to watch a streaming (or over-the-top [OTT]) video service. That number drops significantly to 10% for the next age group (25-34), and declines even further after that, though there is a slight bump in the 55-64 age group, implying that some older parents are using their young adult offsprings’ accounts to watch Orange Is the New Black and Transparent. Parks claims that this credential sharing leads to a $500 million loss of direct revenue to the industry. Certain OTT services, like Hulu and Sling, make it more difficult to share passwords by limiting streaming access to a single device at any given time. The typical Netflix account allows for simultaneous streaming on two screens; customers can upgrade their account to increase that to four screens. Netflix also lets users create different profiles so that multiple users can have their own queues and recommendations.